At Twisted Roots, they pour on the hospitality as well as the wine. With a dozen tasting rooms within a three-block walking area, the Carmel Valley Village is a wine drinker’s paradise. One area you don’t want to overlook is Del Fino Place, a small road behind the Shell Station (it’s a U-turn if you are coming from Carmel) that has a few tasting rooms, a couple of restaurants and one tasting room that PubClub.com recommends you put on your “must visit” list, Twisted Roots Winery. 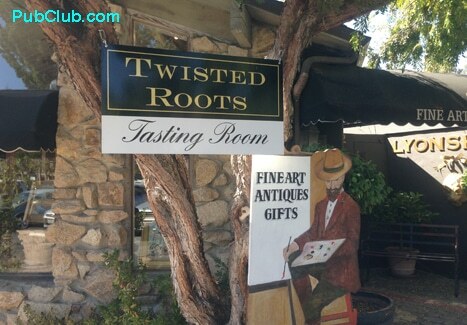 The inviting entrance to Twisted Roots takes tasters through an art gallery and antique shop. For starters, it’s attached to an art and antiques shop. And not just an ordinary art shop with paintings but one with all kinds of artwork and antiques. Secondly, it has a large and welcoming patio, bathed in sunshine and soothed by a long fountain that just makes you want to sit down and sample wines. You’ll want to toss off your shoes and stay a while. And that’s just fine with owners Josh and Julie Ruiz. Heck, they will even bring a delicious oven-baked pizza over to you from the terrific cafe next door, Cafe Rustica. Twisted Roots is rooted in third generation farmers who eventually started planting vines for wine. Its petite sirah is its flagship wine and other varieties are chardonnay, cabrenet sauvignon, and an “1918” old zifandel from roots that were planted in 1918. It also produces seasonal wines. There’s not just wine, but pizza and salads – if you desire – on the very desirable patio. Twisted Roots has a limited, but excellent, selection of family wines. In addition to the patio, Twisted Roots has a tasting room in the front of the building. The petite sirah and the cab are excellent and are void of that pesky aftertaste that seems to linger with some red wines (PubClub.com has yet to try the chardonnay and the 1918). Yet the taste that will remain with you the longest is the hospitality at Twisted Roots. Wine tasting – at least in PubClub.com’s experienced opinion – is more about the experience than the actual quality of the wines. Naturally, you expect to be drinking good wines so that’s a given, but what separates one tasting room from another is how comfortable you feel when you are sampling. And it is here where Twisted Roots is at its best. Whether it’s on the patio or in the front of the art shop, you’ll feel as if you walked into a good friend’s house. You are a stranger here for mere moments. A somewhat unexpected bonus is the fact that the people in the art store are not “don’t touch anything” snobby but rather “hey how are you” friendly. It’s part of the contagious atmosphere at Twisted Roots. So don’t feel too twisted if you roll up to Twisted Roots on a warm Carmel afternoon and wind up staying for a while. The winery is actually in Lodi, CA, and there is a second tasting room in downtown Lodi. And check out the Twisted Roots wine hotel room at the Vendange Inn & Suites in downtown Carmel!